A re-reveal of “Chief Deity of the Heavens, Amaterasu”, explaining an technical ruling as well. For Today’s Card we’re introducing the 《Oracle Think Tank》 Generation Break 8 G Unit “Chief Deity of the Heavens, Amaterasu” from the “Fighters Collection 2017” (on sale May 12nd, 2017). “Chief Deity of the Heavens, Amaterasu” is a G Unit that lets you strengthen your front row and manipulate your Deck! Its act ability lets you look at the top 5 cards of your Deck, add up to 3 of them to your hand and place the remainder on the top or bottom of your Deck in any order you desire! 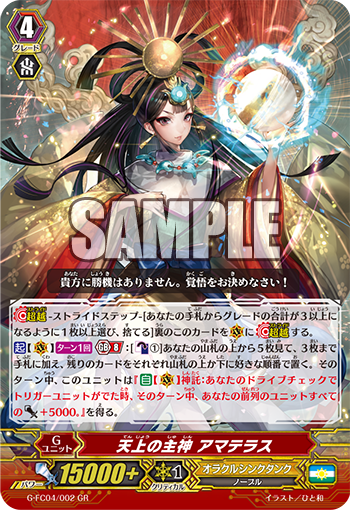 And if you achiee 【Oracle】 during that turn, whe you pull a Trigger Unit due to a Drive Check, all of your front row Units gain Power+5000! In other words, if you pull out 3 Triggers, your front row Units all gain Power+15000! Since you can increase your hand by 3 cards with the aforementioned ability, you can easily achieve 【Oracle】, as well as set up Trigger Units on the top of your Deck, allowing you to attack with higher chances of using this ability. Also, since it gains 【Oracle】 with this ability, it has good afinity with “Bell-ringing Miko, Ouka”. So strengthen your allies, and use Guard sealing abilities to apply pressure to your opponent! From here on, we’ll be continuing to introduce various cards included in “Fighters Collection 2017”! Please enjoy! Q. The Oracle ability of “Chief Deity of the Heavens, Amaterasu” that grants Power+5000 to your front row Units,, when you have 4 cards in your hand at the time, if your hand increases to 5 due to the effect of your Draw Trigger, can you activate the ability? A. You canot activate it. This ability that when you pull a Trigger Unit refers to the state of the game before you activate the Trigger’s ability. Thus, before you activate the Trigger’s ability, you had 4 cards in your hand when a card was placed in the Trigger Zone, since you hadn’t achieved 【Oracle】, you cannot activate the ability.